BCMS and Bellingham House Concerts join forces for another great concert featuring music of Mozart, Roussel and Martinu. Mozart's Quintet for piano and winds in E flat major, K.452 is hailed as one of the most sublime pieces of chamber music ever composed. Other exciting works on the program include Roussel's Divertissement and Bohuslav Martinu's Sextet and Sonata for Clarinet and Piano. 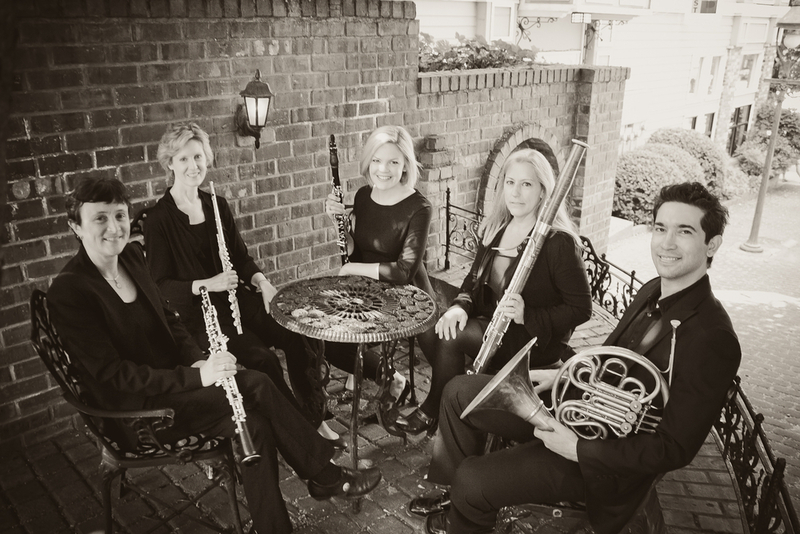 Featuring Victoria Sabo, piano; Dan Sabo, piano; Lisa McCarthy, flute; Jennifer Weeks, oboe; Erika Block, clarinet; Pat Nelson, bassoon, Phillip Thomas, bassoon, and Gustavo Camacho, horn. A modern chamber music concert blending elements of classical, jazz and contemporary styles while capturing the communicative and integrative spirit of ensemble playing. Program features classical works reinterpreted from a jazz perspective, and original jazz compositions arranged for woodwinds and rhythm section to create a unique, ambient blend of these two worlds. Featuring BJ Block, guitars & keyboard; Roger Yamashita, bass; Christian Casolary, drums; Erika Block, clarinet; Lisa McCarthy, flute; Pat Nelson, bassoon; Jennifer Weeks, oboe; and Gustavo Camacho, horn. This program is supported in part by a grant from the Washington State Arts Commission and the National Endowment for the Arts. Featuring Milica Jelaca Jovanovic, piano; Kimberley Breilein, flute; Erika Block, bass clarinet; Kevin Woods, trumpet; Laura Camacho, violin; Shu-Hsin Ko, violin; Antti Niemisto, viola; Coral Marchant, cello; Melanie Sehman, percussion; and Bruce Hamilton, conductor. Join us as we kick off our 2016-2017 season with a kaleidoscope of stylized dances including music rooted in American folk, Scottish fiddle traditions and Argentine tango. Repertoire will include Evan Chambers Come Down Heavy , selections from Astor Piazzolla's Estaciones Porteñas, Appalachia Waltz by Mark O'Connor, Roger Briggs's Jitterbug and more. Featuring Fred Winkler, saxophone; Milica Jelača Jovanović, piano; and Laura Camacho, violin. Season tickets are available for purchase through October 1, 2016. Season ticket includes 15% discount on adult admission to all five concerts of the BCMS 2016-2017 season.